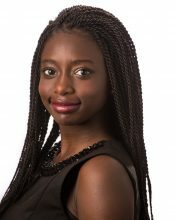 Mariama N’Diaye joined the Social Services team at Bloomberg Associates in June 2017. Previously, Mariama completed an internship at Bloomberg Politics where she helped execute Bloomberg-hosted events at the 2016 political conventions. While helping the Strategy team, Mariama also worked closely with the political show With All Due Respect, receiving a byline for her work in producing a digital video. Prior to this internship, Mariama interned for Bloomberg Associates where she supported an array of projects across disciplines. Her previous internship experiences spanned a private equity law firm, non-profit organizations, political campaigns, and the District Attorney’s office to name a few. A creative problem-solver with an innate ability to manage multiple projects, Mariama currently supports the work of the My Brother’s Keeper Initiative with strategic planning and implementation assistance, occasionally supporting other social service discipline projects. She is a graduate of Williams College, receiving a B.A. in Comparative Politics and Honors in Global Studies. A Native Speaker of Wolof and highly proficient in French, Mariama has focused her undergraduate career on international relations and African studies. She was awarded Honors for successfully completing her thesis on the intersections of urbanization, race relations, and hip-hop in the suburbs of major French cities. Mariama has a passion for public service and plans to spend her career helping cities unlock their full capacity.